at home, in Israel and around the world. brethren and for that we are all proud!" UJA in Geneva, New York. I am very pleased that paign chairman. In The Campaign Missions Spotlight ..
"Celebration '87" held in September. See Page 2. Gerald William, and Pearl and Joel Reinstein. with the elderly residents of Kfar Saba. and crafts center at Kfar Saba. through new eyes this trip,"
more than our experiences there. We shared a special 'oneness.' "
as well as from across the country. their love for one country,"
at a new early childhood center in Kfar. the Milo Early Childhood Enrichment Center at Kfar Saba. Enjoying a relaxing moment were from left. Barbara Wiener. ed around the campus, and had special treats in their Sukkah. shown as the older children get ready to read from the Torah. and Fayne in Fort Lauderdale. builders and developers, Mark A. 24th largest in the country. 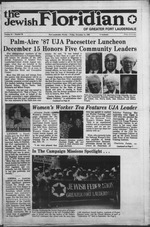 her brethren in need, Alvera A.
said he was "profoundly grateful"
fund-raising events in the history of our local Federation/UJA. How Did Soviet Jewry Fare at Reykjavik? report. They are taken to Babi Yar, a ravine just outside the city. the ones who were still living. went on groaning as loud as before. Then she heard people walking near her, actually on the bodies. which showed signs of life. and taken her bag: she recognized him by his voice. and went off, picking his way across the corpses. "Demidenko! Come on, start shoveling!" started falling on Dina herself. from under the earth ..
inch at a time, likely at any moment to fall back into the pit. ... She heard a whisper which nearly made her jump back. "Don't be scared, lady! I'm alive too." had done. He was trembling and shivering all over. crawled away silently, without a sound. life about every five seconds. be a major topic on the agenda. average of 3.0 or higher. that they do not include the PLO"
37 percent said it should. man, Cantor Abraham Ezring and Rabbi Albert Schwartz. national UJA goal of $900 million. tion of over 10,000 Jews. paign in those 'new' areas. Federation moved to 707 N.
and pledged $6.5 billion in aid. to a summit in 1987. Bakeries open at 8:00 A.M.
Friday, Nov. 21, at 10 a.m.
Jewish Federation. For further in- sion Director, at 748-8400. Israel on the National United Ruby 10 Mission. Thursday evening, 5 p.m., Dec.
man, to new chairman Ely Kushel. outlined at the awards breakfast. for the Homes of Inverrary. Chairmen Louis Colker and M.
ner which will be held on Feb. 1." Nov. 16 Homes of Inverrary Breakfast. Division. 5 p.m. Speaker: Susan Symons. Nov. 17 Women's Division 7:30 p.m. P.M.
Meeting. 7 p.m. At Federation. Nov. 18 CAJE. Adult Education meeting. prepare for the '87 campaign. Woodbridge, New Jersey in 1977. Lucille Stang and Leo Weiasman. be held at noon, Wednesday, Dec.
3 at the Inverrary Country Club. reins of the Tamarac campaign,"
Temple Beth Shalom and Bnai Torah. National UJA in New York. Ben Taub and Harry Treu. hugged an Ethiopian child today? about Jews and about Israel." "Talking to the kids was fun,"
us as we were in them." of our caring," said Judith Levy. Only 12 State* Represented by 24 Senators. "Y" membership is not required. $26.00 surcharge for non members. life to tell the story," Wiesel said. the pain of the murdered Jews,"
Peres said in the telegram. tional Society of Yad Vashem. in Paris from 1944 until 1956.
education for their new school." the Day School, at 583-6100.
overwhelming but there is help. your chest can be a relief. length of meetings in the future. annual United Jewish Appeal campaign. of Daniel and Sadie Marcus. Not since David and Goliath has something so tiny made it so big. It's Tetley's tiny little tea leaves They've been making it big in Jewish homes lor years Tetley knows that just as tiny lamb chops and tiny peas are the most llavortul. the same thing is true for tea leaves. So for rich, refreshing flavor, take time out for Tetley tea Because tiny is tastier! Pops Orchestra." Donation $5, 4. Hawaiian Gardens IV: 8 p.m.
St. $3.50. 739-5141 or 733-9138. 244 S. Univ. Dr. Donation $5.50. review of "Brothers." At Temple. Hall, 701 SW 71 Ave.
Center, 900 NW 43 Ave. Lakes City Hall, 4300 NW 36 St.
a Small Town." At Temple. will discuss, "The New Image." Jewiah Family Service: 7:30 p.m.
Beth Orr. 752-7672 or 721-7464. Book Sale. Coral Ridge Mall. Deicke Aud., 5701 Cypress Rd. try Club, 551 S. Pompano Pkwy. engage in a dialogue with them. 7) will moderate the discussion. day, Nov. 15 service at Kol Ami. Talmud towards a proselyte (Ger)? be held at the Concord Hotel, Nov.
many members of his crew. 6- From three to six years. TAMARAC JEWISH CENTER (721-7060), 9101 NW 57th St, Tamarac. 3SS21. day 8:46 am. RakM Kart F. Stoee. daily 8 a.m.; Sabbath 8 p.m., Sabbath morning 8:46 a.m. Rabbi Avrakass aspaok. TEMPLE BETH ISRAEL (742-4040), 7100 W. Oakland Park Blvd., Sunrise, 38313. Saturday 8:46 am., 7:46 p.m. Rabbi Howard A. Addteea. Caator Maarict A. Nea. Blvd., OeerfMd Beach, 33441. Services: Sunday through Friday 8:30 a.m., 5 p.m.
Joseph Laagaer, Caator Skabtal Aekonaaa. TEMPLE B'NAI MOSHE (942-6380), 1434 SE 3rd St.. Pompano Beach, 33060. Services: Friday 8 p.m. Caator Jekadak Heilbraaa. TEMPLE SHA'ARAY TZEDEK 741-0296), 4099 Pine Island Rd.. Sunrise. 33321.
day 8:46 am., 5 p.m. Rabbi RaadaU Koaigsbarg. Caator Jack Merchant. HEBREW CONGREGATION OF LAUDERHILL (733-9660), 2048 NW 49th Ave..
p.m., Saturday at 8:46 am. Charles B. Fyier. Preudeat (722-7607). TEMPLE OHEL B'NAI RAPHAEL (783-7684), 4361 W. Oakland Park Blvd.. 8asm., 6 p.m., Saturday 8:46 am., 5 p.m.
Tseedars 8 ,.m. Rabbi Are*. Lieberatea. Deerfield Beach, 38441. Services: Sunday through Friday 8 am. and sundown. Saturday 8:46 am. and sundown. Joseph M.
bi Caaba Scbseider. Coagregatiea arialdaat- Honaaa Fleischer. vieea: Friday 8 p.m.; Saturday 10 am. Rabbi Mark W. Groea. Menorah Chapeia, 2306 W. Hillsboro Blvd., Doorflold Beach, 33441, Friday 8 p.m. Bat Mitsvah. RakM Jeffrey BaDea. Castor Rita Shore. day 8:16 p.m., Saturday 10:30 am. RakM 8b si dee. J.
Creek Parkway. Rabbi Brace 8. Warskal. Caator Barbara Roberta. evenings at 8 p.m. Rabbi Lewi* Littaum. As I stood by its door. To all both young and old. As always, there to teach! So well within my reach! ..
fers help to deserving families. for our stock," says Giordano. my Mother and my Mother-in-law. works five days a week! and help guide the operations. Record" of the National Council of Senior Citizens (NCSC). Centrally located to serve all of Broward and North Dade.